Some of the biggest suppliers are already claiming salt shortage and prices have escalated 100% over the 2017-2018 season. This means that certain areas across the Midwest, including Northeast Ohio, won’t have enough salt to keep roads safe. The lack of salt being produced has left the Midwest short of the 10 million tons of salt needed. State and local governments are asking for additional allocations of 10 to 30% more than last year. There is a chance that salt will be difficult to find after Christmas and the New Year. The salt that will be available will likely be brought in from foreign countries. As imagined, shipping salt from Chile into New Orleans and barged north will be very expensive. And as rivers freeze, that salt must be loaded onto trucks and trains, which is even more costly. There are four major suppliers in the Midwest that sell about 10 million tons of salt annually. There are also brokers who import salt from South America, Egypt and Morocco, along with other countries. 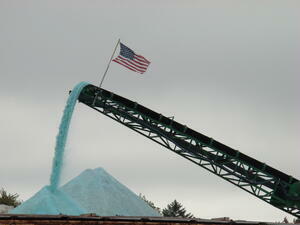 The Ohio Department of Transportation (ODOT) gets the first choice on salt, followed by municipalities. Once those sales are complete, larger brokers, resellers and contractors are next in line. Afterward, smaller contractors and businesses/schools follow in the bid process. First, salt is mined and screened. It is then loaded onto trains, barges, ships and trucks. Once loaded, the salt is shipped in stockpiles. Salt gets sold to the highest bidder and then reloaded into vessels and moved again to brokers, contractors and municipalities. From there, it is loaded again into salt trucks and distributed to snowy surfaces. The transportation costs along the way usually add more cost than the raw material. The issue becomes bottlenecks in the mining and transportation industries. There is plenty of salt in the world, but only so much can be produced in a day/week/month/year. In recent years, many contractors were caught off guard by widespread road salt shortages and found themselves scrambling to keep their properties protected. Some contractors plan for seasonal salt shortages and have a backup plan in place. Turfscape has relationships with two of the four major suppliers that have given us allocations that add up to 66% of our winter supply. Additionally, we have purchased an allocation of salt from Egypt for the remaining supply and stock salt for the season. Contact us to learn more about our snow and ice removal services.